4 F18: //Sweet// dreams or nightmares. 20 F18: //my...// nightmare, which was re- really lame, was the thing that I was... afraid to see a nightmare in my dream. 28 F18: //Scared// in a dream. 43 F17: Yeah I- I remember that. 50 F18: it depends but... and if you see a dream where your... teeth start to drop out, your going to die. 57 F17: Erm what causes nightmares? 61 F17: //Sorry// not sorry. 77 F17: //My mom// actually saw nightmares from... er... Exorcist for three years. 81 F17: Really afraid and I'm "Oh //Mom.//"
83 F17: //And// I'm like having nightmares from having a nightmare erm //[laugh]//. 88 F18: It's- it's not that scary. 94 F18: //Then there's// us [laugh]. 101 F17: and... show themself in a different manner and that might be pretty scary. 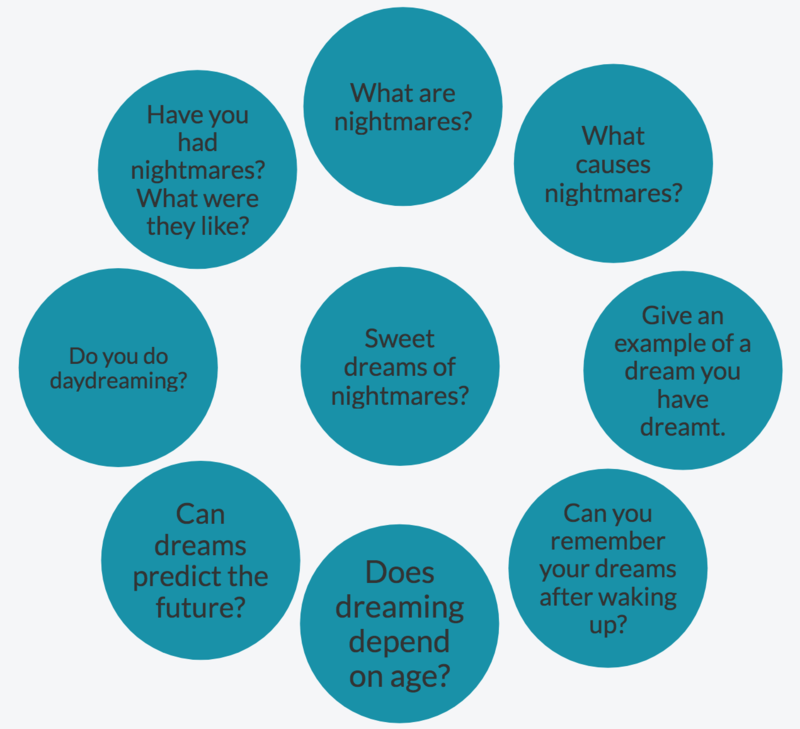 102 F18: Okay... so give an example of a dream you have dreamt, so this isn't a nightmare, just a dream. 111 F18: //well// [laugh] I have one. 155 F18: //Didn't you see// Johnny Depp making pancakes? 164 F17: //[laugh] yeah// and er... and my dad came in and he was like "Mmm, they look really good." 173 F18: //I don't// r- usually remember dreams, I remember nightmares mostly. 176 F17: Er does dreaming depend on age? 196 F17: //Like the// boogyman. 201 F18: Can dreams predict the future? 205 F18: the- it depends. 209 F18: Gonna say that it's possible. 215 F18: experiences are very... well... weird. 219 F18: really... creepy feeling. 225 F18: and something was wrong [laugh] and she saved me, luckily. 227 F18: Do you daydream? 229 F18: //[laugh]// I live in another world which is my [?]imagined[/?] [laugh]. 233 F18: //Yeah// we're weird people. 235 F18: //I don't [?]know[/?] [laugh]// [?]be[/?] very different things //[laugh]//. 240 F17: //[laugh] celebrities// or something. 241 F18: Yeah... but yeah we do day- [laugh] daydreaming. 261 F18: Yeah... and for once [laugh]... I actually made it out. But things I- I called them hydras for some reason. 267 F18: And er we were like "Ooh, where are we going to run?" and my dad and... [CENSORED: forename] started running towards er the bathroom and me and [CENSORED: forename] started running towards the other badroom... ba- bathroom. 283 F18: //then I// started eating and I was really worried that the- they might hear me [laugh]. 299 F18: //Yeah// me too. 337 F18: Does it help [laugh]? 349 F18: and it's really weird since you know it- it's a dream, it's not supposed to be repeated one and- a- again and again and again. It's really weird to see it. 351 F18: And then the- it's like this demon dream... Where the- where there is no demon actually to be seen. It's just a feeling and it's been... it's been actually... six times that I have seen that //same dream//. 354 F17: //Yeah nightmares// mm. Are we ready?